That was the classic line Brody uttered in Jaws once he saw how large the shark was. All grain brewing itself is a bit of a giant shark but instead of a boat, you're gonna need a bigger brewing kettle. There are several benefits to having a brew kettle (or brew pot) that's large in size. The obvious one is that you can brew more beer! There's also less risk of a boilover or overflow occurring. If you want to do small batches of beer, you obviously don't need a massive 15 gallon kettle. However, once you get the taste for brewing, you may just find that 5 gallons just doesn't do it for you any more, and you want to make 12 gallons - so you'll need that bigger kettle. You can always fry a turkey in it for Thanksgiving too! You may want to consider having a built-in thermometer as that can save you some hassle. A ball valve is almost essential. Stainless steel ball valves are used on your kettle to allow you to control the flow of your liquids during transfers. If you have the budget for it, we strongly recommend you get a brew pot which features the valve. They give you so much control and are easy to strip down and clean. A 'sight glass' which allows you to check the level of wort in your kettle. As the wort evaporates due to the boil, it's handy to keep your eye on the level without having to take the lid of the kettle. If you do not have a sight glass, fear not. Crafty brewers have many tricks up their sleeve and having a wooden spoon with marks for the desired wort levels is one of them. Some kettles come with a dip tube or pick up tube as they are known. These devices are used to extract the wort that lies below the ball valve, which makes for a more efficient collection of wort. These are often used with a hops screen which is used to filter out lumps and bumps from the wort. And with that said, here's a selection of the best brewing kettles that we think cut the mustard that will do you a really good service on brewing day. The Bayou Classic gas burner is one of Amazon's most popular sellers and that's because it is one of the best on the market. This is the same reason Bayou's gas burner is a big seller. This unit is designed for the serious all-grain home brewer. 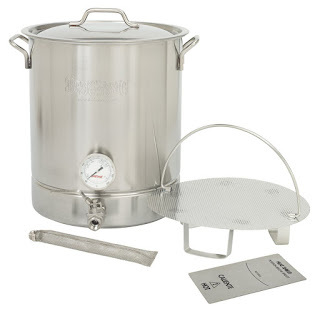 The kettle features a tri-ply bottom and includes a domed lid, stainless spigot with Ball Valve, side-mount 3-inch Brew Thermometer ranging 60-220 degrees, stainless false bottom that sets 3.25 Inch above the bottom of the pot, and a tube shaped filter screen. The bulkhead fittings enable easy attachment of thermometer and spigot for a water-tight seal. Side calibration measuring in gallon and quart that read from the inside of the kettle, enabling more accurate water level setting. The try-ply bottom promotes even heating and helps prevent against scorching, while the all stainless construction has no interaction with wort or acids. The narrow diameter and high side walls reduce the chance of boil overs, and the false bottom fits tightly on the low side indention to reduce particles and grain from entering the spigot chamber. "Kettle is very nice. Polished and huge. It's hard to imagine how large a 16gal kettle is until you get it. It's a monster. The included accessories make this a very versatile kettle. I am using mine as a boil kettle right now but plan on buying another in the future to use as an upgrade to my Mash Ton from a cooler." "This is a quality kettle, and a decent price. I use it in tandem with a standard size keggle for my HLT, and can brew up to 15 gallons at a time if I feel incredibly strong and dedicated (15 gallons of wort weighs a lot). The thermometer works well, and has clear markings for various mash stages, if you do more than a single-step infusion." 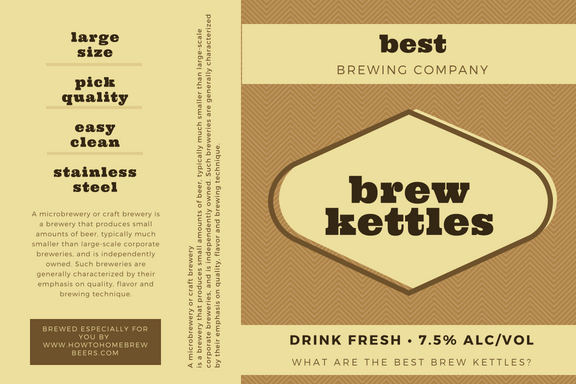 "Great brew kettle. Very large with a tri-ply bottom. Have used it twice for brewing in a bag, thus far. Will hold a large grain bill - 16 lbs for me on my last brew. Screen will clog up, but not so much to not allow me to drain into the fermenter. Temp gauge required no calibration upon cross measuring. I did leave the kettle outside for a few days by accident and was pleased to see no signs of rust." "The kettle held my mash at temp for the full hour, was easy to clean up and easy to transfer the wort to the boil kettle." This beast from Blichmann Engineering almost makes boiling up a wort too easy! The BoilerMaker™G2 brew kettles have been completely redesigned from the ground up with world-class American engineering and quality US manufacturing! Bare bones kettles might lure you in with attractive prices but by the time you add extra equipment you need or want – all standard in the BoilerMaker G2 comes into its own. All models carry a limited lifetime warranty and are available in Celsius or Fahrenheit models. Blichmann Engineering boasts that this fresh design reflects the passion they have for quality, ergonomics, aesthetics, performance, and simplicity. Comes in 7.5, 10, 15 or 20 gallon size. "The design of the kettle is fantastic. Great lids, handles, and I love the sight glass. Makes it really easy to clean it. "Only con is if you plan on using this on gas. My use is electric. The bottom doesn't have a nice thick plate in it, it is just as thick as the sides. This will cause it to heat up more slowly on gas. For the price I would expect it to be included but for me on electric it is actually a plus as it makes it easier to move the kettles around." "I think my old 15G kettle is heavier than this 20G Blichmann one." Check out the price on Amazon - these units have free shipping! 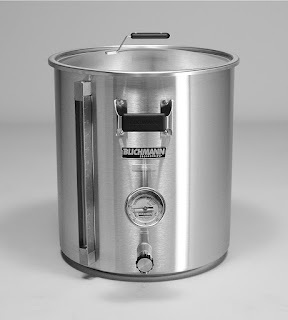 If you are looking for something with a more modest budget or lower value, you'll need to dispense with the thrills and spills of the Blichman and for your stock standard steel pot, And the 8 gallon Tall Boy does just that. This means you will be limited to a 5 gallon brew, which is to be fair, is a pretty standard brew. 4mm thick tri-clad bottom designed to stop bullets and prevent scorching by encouraging heat dispersion. Made by the reputable Northern Brewer company (check out their wort chillers). Can use it to deep fry turkey! Here's what some genuine users of the Tall Boy have said in their Amazon reviews. "BUILT FORD TOUGH! Seriously though, this thing is made like a tank everywhere and I love it, well worth the money!" "Awesome. Thick bottom. Used to deep fry my 25 pound Thanksgivin turkey. Heated great no burnt crud on the bottom and easy clean up because nothing burned." "Really good quality! Nice riveted and welded handles, extra thick bottom, strong sides, and is just right size for a 5 gallon brew. If you're doing a full 5 gal, be careful during the hot break, as the wort level is pretty close to the top. Stand guard at the gas valve! Excellent product, cleans well, and can also do a turkey or a beach boil. Get it!" "I've brewed with it a few times now and it works great. I think it would be better if it had some volume markings." 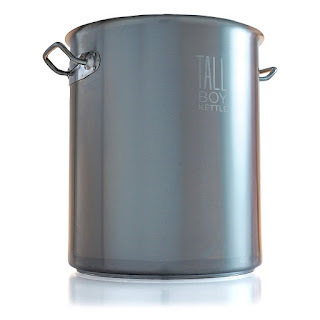 Check out the price of the Tall Boy on Amazon - it comes with free shipping. 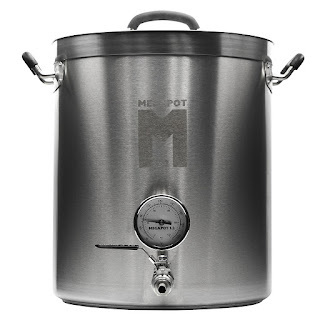 Northernbrewer brag that their MegaPot 1.2 "is a masterpiece, not just another steel pot.". Apparently crafted of stainless steel for ease of cleaning. The unit features silicone handles on the kettle and lid serve to limit scorching. The handles are riveted in place to aid in lifting a hot liquid-filled pot. Northern brewer claims that there will be no weld failures. Available in 8, 10, 15, 20, and 30 gallon sizes, with or without ball valve and thermometer. "This pot has performed well during both batches I've made so far. The bottom of the pot is as solid as they say, about 4mm thick. No issues on a glass stove. The thermometer and spigot need to be assembled, but again, it wasn't hard to do and it hasn't leaked at all. It's nice to have a good sturdy pot for brewing." "This kettle is everything I hoped it would be, and much more. The construction feels rock-solid, and all the elements of the pot, including the accessories that came with it (ball valve and thermometer), are first class. This is a pot meant to last a lifetime, and I feel it was money well spent for the long haul. After running my first batch with this pot over yesterday, it passed all my quality tests, and I am delighted with my purchase." "This thing is very heavy duty, has a thick clad bottom for heat distribution, thick walls and also has very useful gallon markings on the inside of the pot where you can easily look at the liquid level and know your volume. Nice heavy lid, rubber grips, and heavy-duty ball valve included. This is a very high quality product." What are you waiting for? With free shipping, you should check out the price on Amazon. Should you buy Aluminium or steel? Brew kettles come in both metal forms, each having its own benefit. Aluminium is lighter for example but is less durable than steel kettles. They also need to be maintained well due to ensure that the oxide layer that forms is not broken. This is because the layer prevents the aluminium from passing off flavors into the wort or mash. While aluminium kettles will transfer heat faster than steal, if you have a really good gas burner, this shouldn't really be a concern with your buying decision. In our realm, we recommend you go for the steel kettle - the only drawback is they are more expensive than aluminium units. Stainless steel is also fairly easy to clean. What is the best way to clean a brew kettle? The gunk that is left at the bottom of the kettle is called the trub and it's usually quite manageable to get off. Many brewers like to soak the trub in water with Powdered Brewery Wash (PBW). Do not use steel wool or anything sharp to clean the unit, use something soft like a non-abrasive sponge or a soft plastic brush. You are trying to avoid putting scratches in the steel! A bit of elbow grease is all you really need! It's also good to clean your kettle as soon as you can after brewing - this will give the trub less time to harden and should ensure a straightforward cleaning job. If you have an aluminium kettle, you'll want to avoid anything caustic and stick with ordinary washing detergent. I personally dispose of the trub on my vegetable garden! Finally, once you have chosen your kettle and brewed with it, you'll need to keep an eye out for beerstone, which is a calcium based build up which can harbor microorganisms that will ruin your beer. Once that wort has been boiled, you've now got to cool it down so you can pitch the yeast - but what you've done is heated many gallons of water so hot it can give you a terrible scalding. So be careful! Ensure your set up is sturdy. Your burner needs to be flat, and properly assembled if necessary. Your kettle should have handles (ones coated with silicon are perfect) to assist with moving. Even so, you may want to consider using an oven mitt and a waterproof apron. This is especially so if you are deep frying a thanksgiving day turkey with oil. And shoes, wear shoes! And finally, be wary of any children around your set up. Frankly, we recommend you let the kids stay inside and watch Frozen while you have the gas going!